Earlier this year Mozilla announced its Webmaker effort aimed at giving everyday users DIY skills for the Web, and recently it rolled out a key piece of that initiative. Launched on Sunday at the MozFest event in London, Popcorn Maker 1.0 is a free Web app that's designed to make it easy to enhance, remix, and share Web video. 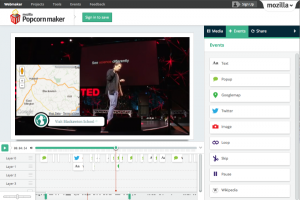 Working via a simple drag-and-drop interface, users can add live content to any video--including photos, maps, links, social media feeds, and more--all from the comfort of their own browser. The result, according to Mozilla, is “a new way to tell stories on the Web,” with videos that are rich in both context and links. Whereas Popcorn.js has been available mostly just to developers, however, “Popcorn Maker puts that power in everyone’s hands,” Gaylor said. A Sunday post on the Mozilla Hacks blog explains in more detail how the new tool works. In essence, Popcorn Maker is an HTML5 Web app for combining Web media with images, text, maps, and other dynamic Web content, tech lead Bobby Richter explains. Once created, such videos are hosted by Popcorn Maker as simple HTML pages in the cloud that can be shared or embedded in blogs or other sites. Every remix created through Popcorn Maker also provides a “Remix” button of its own, allowing anyone watching to become a creator themselves by using the current remix as a basis for their own creation. Popcorn Maker 1.0 is now available for anyone to use for free on the Webmaker site. There's also a free tutorial to get you up and running. Given the prominence of video in today's social media landscape, I'm thinking there's more than a few small businesses out there that could benefit greatly from a tool like this. If that sounds like you, this could be a good time to check Popcorn Maker out.